Global forestry and agricultural tractor sales market expected to reach USD 100 billion by 2025, growing at a CAGR of 4% between 2017 and 2025. The global forestry and agricultural tractor sales market is segmented on the basis of drive type, power, application, and the geographical regions. The report covers forecast and analysis for the forestry and agricultural tractor sales (FATS) market on a global and regional level. The report also provides historical data of the market for better understanding the dynamics and trends prevalent in the market. Detailed information about the market opportunities and challenges are discussed. The volume of the tractor sales has been determined in units of tractors sold annually. The market numbers have been calculated using top-down and the bottom-up approaches along with data triangulation. The forestry and agricultural tractor sales (FATS) market has been analyzed using Porter’s Five Forces Analysis. The market is segmented on the basis of drive type, power, and application which in turn are bifurcated on global, regional level as well as country level. All the segments have been evaluated based on the present and the future key industry trends. The report deals with the in-depth quantitative and qualitative analyses of the forestry and agricultural tractor sales (FATS) market. Detailed list of suppliers of FATS and buyers (end-users). Forestry and agricultural tractors is an engineered vehicle which is specially designed to provide high torque at low speeds. Tractors can be used in agriculture for various purposes including plowing, tilling, disking, harrowing, and planting, among others. Similarly, in forests tractors are used for timber removal, chipping, and forest harvesting, among others. Various equipment, tools, and machinery such as tedders, balers, seed drills, field chopper, field sprayers, combine harvester, compost turner, beet or potato harvesters, sugar cane harvester, chippers, feller bunchers, forwarders, and skidders, among others could be attached to tractors for carrying different tasks at farms or forests. The global forestry and agricultural tractor sales market stood at more than 2,000 K units in the year 2016 and it is expected to reach more than 2,800 K units by 2025. The global forestry and agricultural tractor sales market is expected to exhibit a CAGR of more than 3% between 2017 and 2025. The global forestry and agricultural tractor sales market was valued at more than USD 75 billion in the year 2016 and it is expected to reach more than USD 100 billion by 2025. The global forestry and agricultural tractor sales market is expected to exhibit a CAGR of around 4% between 2017 and 2025. The major factor driving the growth of forestry and agricultural tractor sales market is growing need to increase agricultural output. As the population has been increasing exponentially across the globe, agricultural output needs to be increased to meet the rising demand for food. Manual labor is not sufficient to maximize productivity and thus mechanized operations at the farm are an increasing trend. The revenues and profits on agricultural output are increasing in most of the regions across the globe. Rising prices of the food products have led to increased profits for personnel involved in the agriculture sector. As a result, the spending power of farmers and personnel involved in agriculture industry has increased significantly. This increase in income level is complemented by the lower interest rate on loans for the agriculture industry. Moreover, tractors and other agricultural equipment have been levied with a minimum surcharge on loans. This has facilitated for higher adoption rate of tractors across all types of farmers worldwide. Emerging economies in Asia Pacific region such as India and China among others with the expected higher rate of agricultural activities could provide ample opportunities for forestry and agricultural tractor market players. As these conventional agricultural activities in this region shift towards mechanized agricultural activities, ample growth opportunities are expected for tractor and supplementary equipment manufacturers during the forecast period. 4-wheel drive tractors provide various advantages such as the better power to weight ratio which results in extra power and lower fuel consumption. In the drive type segment, 4-wheel drive (4WD) type held leading share. As the surface is usually uneven or muddy in farms and forests, this 4-wheel drive type of tractor provides better traction and overall performance than other types of tractors. However, higher costs of the 4WD tractor could hamper the sales of this type of tractor during the forecast period. Above 50 kW power range dominated the global forestry and agricultural tractor sales market in 2016. To finish work rapidly on a vast piece of land, a bigger sized tractor is required to accommodate bigger equipment and tools for the same. As the size and weight of tractor increases, so does the power required to pull the tractor. As farmers strive to complete their farm operations in lesser time, the adoption of higher power tractors has also increased. Furthermore, high powered tractors are preferable to uneven and steep land surfaces to offer better pulling and pushing power coupled with good traction and torque. Agriculture dominated the global forestry and agricultural tractor sales market in 2016. In agriculture application, the tractor is utilized for numerous tasks. Gradually, more and more manual tasks in agriculture have been mechanized through the adoption of tractors in the farms. Along with these, special purpose tractors are also used in agriculture such as row crop tractors, wheatland tractors, and high crop tractors, among others. The Asia Pacific dominated the global forestry and agricultural tractor market with 50% share in total revenue generated in 2016. Increasing agricultural activities, rising income levels, increasing labor costs, and need for enhanced crop output has boosted the demand for tractors in this region. 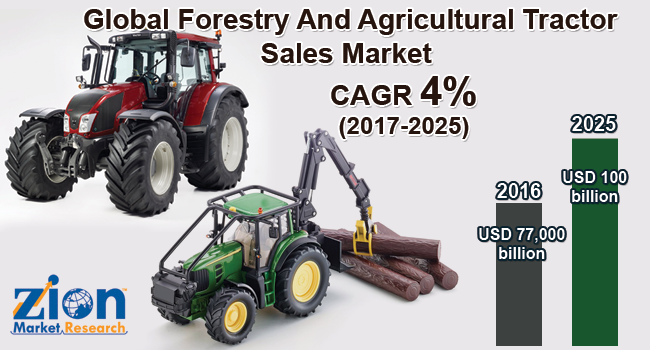 The report includes detailed profiles of the prominent market players that are trending in the global forestry and agricultural tractor sales market. The list of the players that are compiled in the report include Deere & Company, CNH Industrial, Kubota, Mahindra, Kioti, AGCO Corporation, Claas, BCS America, J C Bamford Excavators Ltd., SDF, Tractors and Farm Equipment Limited, V.S.T Tillers Tractors Ltd., ZETOR TRACTORS a.s., First Tractor Co. Ltd. (YTO), Indo Farm Equipment Limited, Lovol Heavy Industry Co., Ltd., Shandong Shifeng (Group) Co., Ltd., Sonalika International Tractors Ltd., Zoomlion Heavy Industry Science & Technology Co., Ltd., Changzhou Dongfeng Agricultural Machinery Group Corp., Ltd., Shandong Wuzheng Group Co. Ltd., Jiangsu Yueda Intelligent Agricultural Equipment Co., Ltd., Force Motors Ltd., and much more. The prominent market players maintain the competitive edge in the global market by innovating and introducing new cost-effective tractors. Players consolidate by undertaking merger and acquisition activities. Additionally, major players have started their operations in emerging economies to provide cost-effective products in these regions and improve their overall market share across the globe.